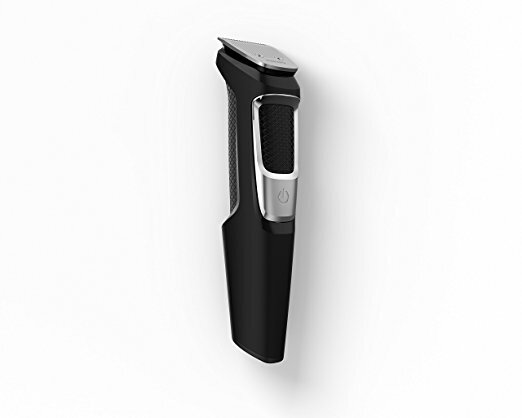 Gotta give credit where credit is due, this beard trimmer gets the job done. I recently returned home from a multi-week roadtrip with my daughter wherein I forgot to bring my battery operated beard trimmer. I had left the trimmer in my bathroom, on the windowsill where it has lived for 10 years. I returned home to find my cat had gently displaced it. I tried to put it back together and thought I had it working. About half way through my beard the trimmer ceased to work. I ordered this Norelco as a replacement, spent two days looking silly and voilla! Back to normal. This Norelco MULTIGROOMER MG3750/50 sure has a pretty name. Aside from that it works exactly as you'd expect. On and Off. There are a wide selection of blade guards, for beards, heads and canine pals -- cause I'm not discerning. Norelco claims you won't have to oil the blade, and it stays sharp for atleast 2 years. I did not notice the old one had gone dull, just exploded from a fall, however this does just feel 'stronger' in every regard. Could be its newness, or sharper blades. You can also buy replacement blades, which seems pretty handy. I was unaware of this with prior models. I am pretty sure it is the newness of the trimmer that is making me want to try strange new trimming options. My daughter absolutely vetoed a French Musketeer look. Sure, we’ve all worn a bee beard for a minute or two, but Canada’s own Juan Carlos Noguez Ortiz just broke the Guinness World Record by sitting for more than an hour with a facehive going. Impressive!